The developers of TimePassages Mobile took years to produce their latest software offering and it shows. Released with the arrival of 2012, the app sets a new standard for astrology on a mobile device. 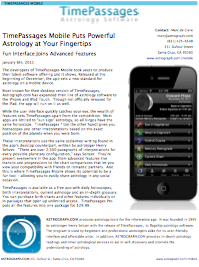 Most known for their desktop version of TimePassages, Astrograph.com has expanded their line of astrology software to the iPhone and iPod Touch. Though not officially released for the iPad, the app will run on it as well. While the user interface quickly catches your eye, the wealth of features sets TimePassages apart from the competition. Most apps are limited to "sun sign" astrology, so all Virgos have the same horoscope. TimePassages surpasses these by giving you unique horoscopes and other interpretations based on the exact position of the planets when you were born. These interpretations use the same acclaimed writing found in the app's desktop counterpart, written by astrologer Henry Seltzer. "There are over 2,500 paragraphs of interpretations for every possible planetary configuration," says Seltzer. They're present everywhere in the app: from advanced features like transits and progressions to the chart comparisons that let you view your compatibility with friends or romantic partners and then email a copy to them. And this is where TimePassages Mobile shows its potential to be an enjoyable tool - allowing you to easily share astrology in any social occasion. TimePassages is available as a free app with daily horoscopes, birth interpretations, current astrology and an in-depth glossary. You can purchase birth charts and other features individually or in packages that open up unlimited access. TimePassages Pro puts all the features into one package for $29.99. ASTROGRAPH.COM produces astrology tools for the information age. It was founded in 1995 by astrologer Henry Seltzer with the release of TimePassages, its flagship astrology software. The program is used by beginners and professional astrologers alike for its user-friendly interface and affordable price. In addition, ASTROGRAPH.COM provides in-depth astrology readings and other astrological services to aid in self-discovery and promote the understanding of astrology.